Nocardiosis is an acute, subacute, or chronic infectious disease that occurs in cutaneous, pulmonary, and disseminated forms. Primary cutaneous nocardiosis manifests as cutaneous infection (cellulitis or abscess), lymphocutaneous infection (sporotrichoid nocardiosis), or subcutaneous infection (actinomycetoma). Pleuropulmonary nocardiosis manifests as an acute, subacute, or chronic pneumonitis, usually in immunocompromised hosts, although isolated cases have been reported in immunocompetent hosts. Disseminated nocardiosis may involve any organ; lesions in the brain or meninges are most common. 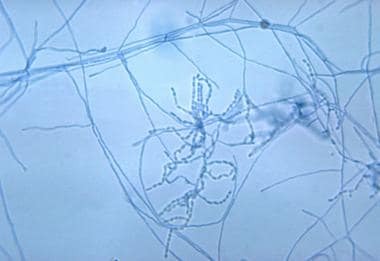 Members of the genus Nocardia are aerobic actinomycetes that are ubiquitous saprophytes in soil, decaying organic matter, and fresh and salt water. Over 100 species of the genus Nocardia have been identified, more than half of which have been described during the last decade. The taxonomy has been challenging and likely remains in evolution. [1, 2] Most human infections are due to members of the formerly called Nocardia asteroides complex. N asteroides complex was later separated into Nocardia abscessus, Nocardia brevicatena-paucivorans complex , Nocardia nova complex, Nocardia transvalensis complex, Nocardia farcinica, Nocardia asteroides sensu stricto, and Nocardia cyriacigeorgica; however, use of the term " N asteroides complex" is currently outdated because of the heterogenous group of organisms it includes. Nocardia species also cause infections in animals, including bovine mastitis and sporotrichoid nocardiosis in horses. When observed microscopically, either in Gram-stained smears of clinical specimens or cultures or on histopathology in tissues, Nocardia organisms are branching, beaded, filamentous, gram-positive bacteria with a characteristic morphology to a trained observer. See the image below. High-power microscopic appearance of Nocardia. Image courtesy of CDC. Nocardia are typically weakly acid-fast after traditional staining and positive on modified acid-fast staining, but this is not invariable. The cutaneous, lymphocutaneous, and subcutaneous forms of nocardiosis arise from local traumatic inoculation. These infections are not necessarily associated with immunocompromised host states, but dissemination from these sites of inoculation is more likely in immunocompromised hosts, particularly those with impaired cell-mediated immunity. Pleuropulmonary nocardiosis presumably arises from inhalation exposure. Disseminated nocardiosis results from hematogenous dissemination, usually from a pulmonary focus. Most persons with disseminated nocardiosis have underlying immunocompromising disease or are receiving immunosuppressive therapy. Nocardiosis produces suppurative necrosis with frequent abscess formation at sites of infection. See the image below. Photomicrograph of tissue biopsy stained with Gomori methenamine silver demonstrating acute inflammatory response and organisms compatible with Nocardia. Clusters of nocardiosis have been described in hospitalized patients, related to contaminated fomites from construction or contaminated hands of staff. No reliable estimates on the international frequency of nocardiosis are available. Cure rates with appropriate therapy are approximately 100% in skin and soft-tissue infections. Ninety percent of pleuropulmonary infections can be cured with appropriate therapy. Nocardiosis has no apparent racial predilection. Nocardiosis is more common in males than in females, with a male-to-female ratio of 3:1. This difference may be related to exposure frequency rather than a gender difference in susceptibility. All ages are susceptible to nocardiosis. The mean age at diagnosis is in the fourth decade of life. Patients with nocardiosis must be educated about the need for protracted antimicrobial therapy. Patients with nocardiosis should be informed of the potential adverse effects of protracted antimicrobial therapy and which circumstances require reporting to their physician promptly. Wilson JW. Nocardiosis: updates and clinical overview. Mayo Clin Proc. 2012 Apr. 87(4):403-7. [Medline]. Euzeby Jean P. List of prokaryotic names with standing in nomenclature. www.bacterio.net/. Available at http://www.bacterio.net/-allnamesmr.html. Accessed: 11/20/2014. Beaman BL, Beaman L. Nocardia species: host-parasite relationships. Clin Microbiol Rev. 1994 Apr. 7(2):213-64. [Medline]. Centers for Disease Control and Prevention. Available at http://www.cdc.gov/nocardiosis/infection. Accessed: June 7, 2013. Smego RA Jr, Moeller MB, Gallis HA. Trimethoprim-sulfamethoxazole therapy for Nocardia infections. Arch Intern Med. 1983 Apr. 143(4):711-8. [Medline]. Lavalard E, Guillard T, Baumard S, Grillon A, Brasme L, Rodríguez-Nava V, et al. Brain abscess due to Nocardia cyriacigeorgica simulating an ischemic stroke. Ann Biol Clin (Paris). 2013 Jun 1. 71(3):345-348. [Medline]. Boiron P, Locci R, Goodfellow M, et al. 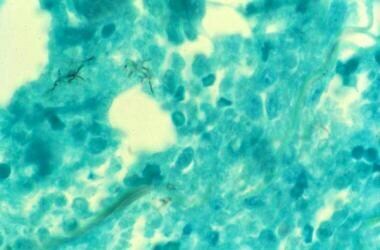 Nocardia, nocardiosis and mycetoma. Med Mycol. 1998. 36 Suppl 1:26-37. [Medline]. Castro JG, Espinoza L. Nocardia species infections in a large county hospital in Miami: 6 years experience. J Infect. 2007 Apr. 54(4):358-61. [Medline]. Filice GA. Nocardiosis in persons with human immunodeficiency virus infection, transplant recipients, and large, geographically defined populations. J Lab Clin Med. 2005 Mar. 145(3):156-62. [Medline]. Hui CH, Au VW, Rowland K, Slavotinek JP, Gordon DL. Pulmonary nocardiosis re-visited: experience of 35 patients at diagnosis. Respir Med. 2003 Jun. 97(6):709-17. [Medline]. Kilincer C, Hamamcioglu MK, Simsek O, et al. Nocardial brain abscess: review of clinical management. J Clin Neurosci. 2006 May. 13(4):481-5. [Medline]. Lederman ER, Crum NF. A case series and focused review of nocardiosis: clinical and microbiologic aspects. Medicine (Baltimore). 2004 Sep. 83(5):300-13. [Medline]. Lerner PI. Nocardiosis. Clin Infect Dis. 1996 Jun. 22(6):891-903; quiz 904-5. [Medline]. Matulionyte R, Rohner P, Uckay I, et al. Secular trends of nocardia infection over 15 years in a tertiary care hospital. J Clin Pathol. 2004 Aug. 57(8):807-12. [Medline]. Pintado V, Gomez-Mampaso E, Cobo J, et al. Nocardial infection in patients infected with the human immunodeficiency virus. Clin Microbiol Infect. 2003 Jul. 9(7):716-20. [Medline]. Saubolle MA, Sussland D. Nocardiosis: review of clinical and laboratory experience. J Clin Microbiol. 2003 Oct. 41(10):4497-501. [Medline]. Pilsczek FH, Augenbraun M. Mycetoma fungal infection: multiple organisms as colonizers or pathogens?. Rev Soc Bras Med Trop. 2007 Jul-Aug. 40(4):463-5. [Medline]. Martinez Tomas R, Menendez Villanueva R, Reyes Calzada S, et al. Pulmonary nocardiosis: risk factors and outcomes. Respirology. 2007 May. 12(3):394-400. [Medline]. Rosman Y, Grossman E, Keller N, Thaler M, Eviatar T, Hoffman C, et al. Nocardiosis: A 15-year experience in a tertiary medical center in Israel. Eur J Intern Med. 2013 May 29. [Medline]. Beaman BL, Beaman L. Nocardia species: host-parasite relationships. Clin Microbiol Rev. 1994 Apr. 7(2):213-64. [Medline]. [Full Text]. Peleg AY, Husain S, Qureshi ZA, et al. Risk factors, clinical characteristics, and outcome of Nocardia infection in organ transplant recipients: a matched case-control study. Clin Infect Dis. 2007 May 15. 44(10):1307-14. [Medline]. Uhde KB, Pathak S, McCullum I Jr, et al. Antimicrobial-resistant nocardia isolates, United States, 1995-2004. Clin Infect Dis. 2010 Dec 15. 51(12):1445-8. [Medline]. Brown-Elliott BA, Biehle J, Conville PS, Cohen S, Saubolle M, Sussland D. Sulfonamide resistance in isolates of Nocardia spp. from a US multicenter survey. J Clin Microbiol. 2012 Mar. 50(3):670-2. [Medline]. Minero MV, Marin M, Cercenado E, Rabadan PM, Bouza E, Munoz P. Nocardiosis at the turn of the century. Medicine (Baltimore). 2009 Jul. 88(4):250-61. [Medline]. Plain chest radiograph in a patient with nocardiosis. Image courtesy of Applied Radiology, Anderson Publishing, LTD. Chest CT scan in a patient with pleuropulmonary nocardiosis. Image courtesy of Applied Radiology, Anderson Publishing, LTD. Brain CT scan in a patient with nocardial brain abscess. Image courtesy of Applied Radiology, Anderson Publishing, LTD.